Leading Manufacturer and Exporter of Conveyor System & Belt such as 90 Degree Curve Conveyor System PU Belt, 90 Degree Conveyor and 90 Degree Conveyor System Curve Belt from Mumbai. We are able to provide our clients with a quality range of 90 Degree Curve Conveyor System PU Belt, which is highly demanded by the clients. These products are used to change the direction of the conveyor line from 90 degrees to the left or right, while keeping the pieces oriented in the same direction relative to the conveyor bed. 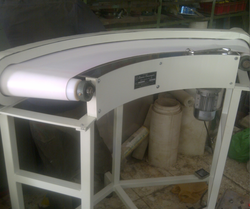 With the help of our experienced engineers, we are able to design and develop 90 Degree Belt Conveyor. Manufactured and designed by making use of high grade raw material that is procured from the reliable vendors of the market. 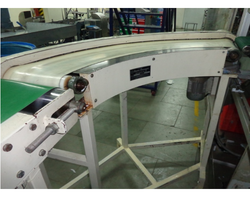 Keeping in mind our client's varied expectations, we are offering them 90 Degree Conveyor System Curve Belt. It is manufactured in accordance with their specifications so that it could render an excellent performance at their end. We used supreme-grade raw material to manufactured this product. It is tested in our quality testing laboratory on different parameters so as to make it comply with the predefined norms of our domain. 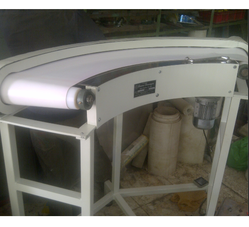 Looking for Conveyor System & Belt ?